I was staring at a butternut squash. It had lived in my fridge for some time. It was just sitting there uselessly. It gave me a hopefully look every time I opened the fridge door, but I resolutely ignored it. Until I was desperately needing inspiration for dinner one night. I'll roast you I thought and had a look around the fridge to see who could join him in the roasting pan. Mini sweet peppers, an onion and a courgette. Perfect. I'd usually toss these roast vegetables through pasta, but I really wanted a salad, so I mixed in a packet of ready to eat puy lentils with porcini mushrooms for a bit of interest and topped it with goat cheese (for me, not Graham) and rocket (also just for me and not Graham). My husband and child just don't like peppery rocket. I don't get it. I think it's gorgeous stuff. So I kindly served Cooper and Graham spicy potato wedges instead of the lovely green stuff. You can't say I'm not good to them, although I had to bite my tongue when Cooper told me the black lumps (puy lentils) were disgusting and he wouldn't eat them. I had to bite my tongue even more when he started picking them out of his salad one by one. Grrrrrrrrrrr! The crusty bread you can see in the picture is Cherry Tomato and Basil Focaccia from Dell'UGO who are known for their chilled pasta. They kindly sent me out three flavours to try, which will also be found in the chilled cabinets of supermarkets from the 18th of May. It was really crispy on the outside with a flavourful moist centre. I'd definitely serve them again. Really nice quality. 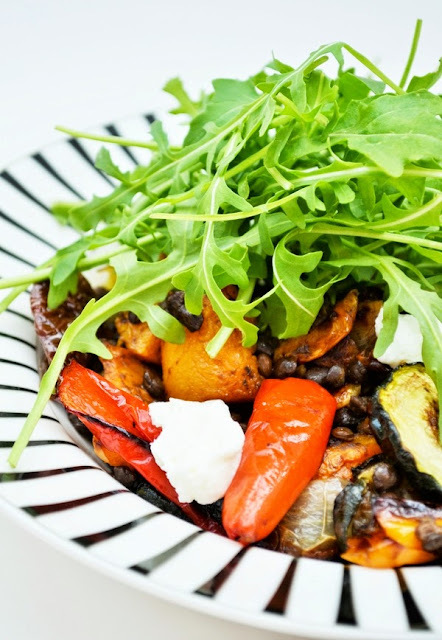 A simple roast vegetables salad with ready to eat puy lentils (a must for all store cupboards), goats cheese and rocket. 1. Preheat oven to 220 °C /200°C fan/ gas mark 7.2. Toss the vegetables in the olive oil.3. Spread the veg out in a roasting pan and cook for 25-30 minutes until the vegetables are soft and charring at the edges.4. 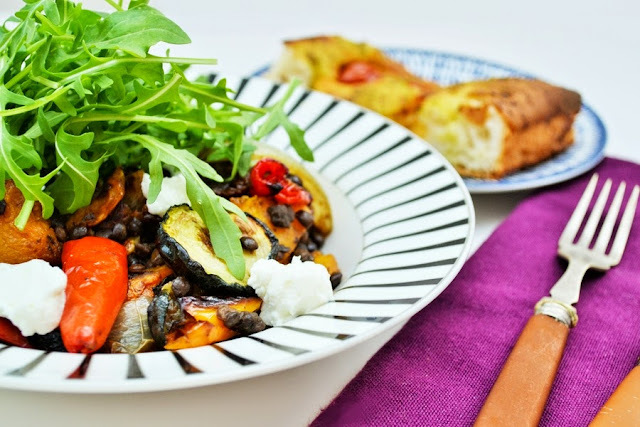 In a bowl gently mix the roast vegetables with the puy lentils and season.5. Serve in bowls, topped with some crumble goats cheese and a generous mound of rocket.7. Enjoy! 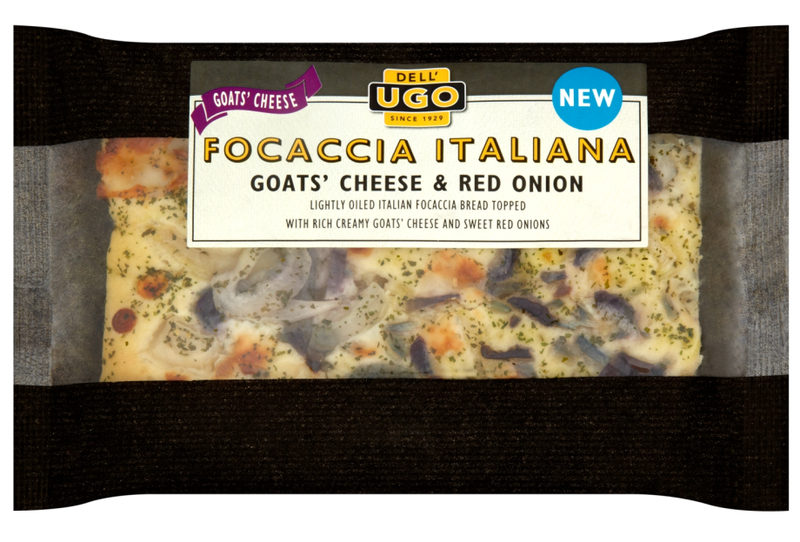 Disclosure: Dell'UGO sent me some focaccia to try. They didn't ask me to post about it, just to let them know what I thought. I enjoyed it so decided to share that with my readers. This is just the kind of salad I would go for any lunch or evening. Serving it with that focaccia turns it into so much more of a meal. My kids will eat rocket but only if it's covered in lots of salad dressing and I chop it up a bit! I'd try that Laura, but I can't get him to go near salad leaves or dressing. He likes sweetcorn, carrot, cucumber and red pepper, that's about it salad wise. Ha, I love the intro story!! 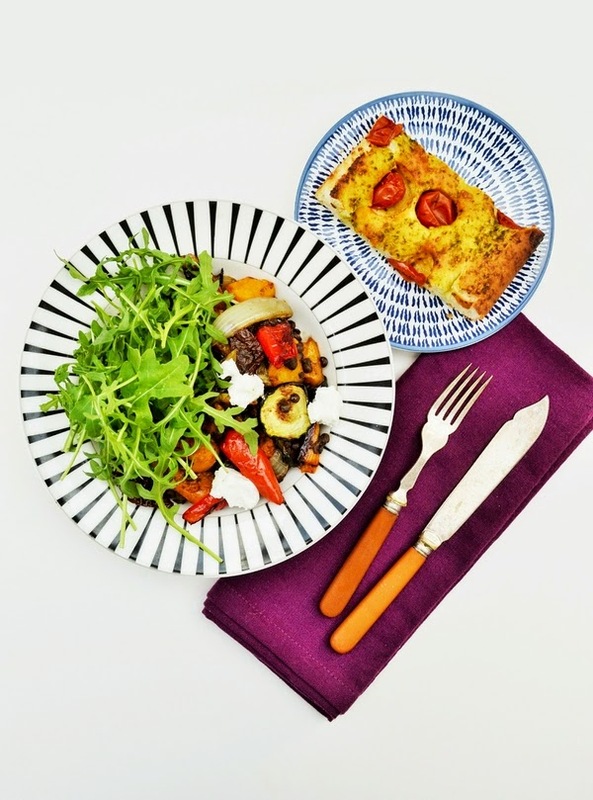 Great recipe - I adore puy lentils. Mush lentils up in soup or dhal and little Cooper won't have a clue! This all looks totally delicious Jac and I love lentils in any form. I'm like you and love lentils. I'm such a sucker for butternut squash -- not only the taste but the colour just looks so damn fine on the plate! I know, you can't beat it Kavey. honestly, such joyous and bright photo's, this is a glorious salad! I am loving your salad it looks really colourful and very delicious.My daughter picks peas out (she hates them)so I know how you felt when cooper picked out the lentils!!! I loe peppery rocket and have it most days with my salad at lunch. But I can see why it's not for everyone. The focaccia looks lovely! This looks great. I know what I'm having for lunch tomorrow!